Fashion goes back to nature with this gallery of 31 full-page images to color, in which glamorous models sport dresses and hats consisting of intricately entwined flowers, leaves, and vines. 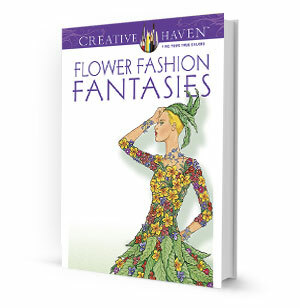 Flower Fashion Fantasies coloring book includes glamorous gowns and equally appealing accessories, modeled by an array of delicately featured models. The gowns themselves represent a wide range of floral fashions with motifs from Japanese, Chinese, and Indian art, as well as botanical sources. Enjoy the intricacies of these designs as you color the distinctive illustrations. Find your true colors and let your imagination run wild!